J. Howard Miller (Born in 1918) grew up during the Second World War, and got his inspiration from the works of Norman Rockwell, a Realist and Americana artist. Miller used his passion and talents to create many works of art including posters depicting the lives of the women behind the war effort. He wanted to appreciate the works of these women as it is known that the success of the war effort depended on these women because they took over the factory jobs that were left by the men who went to war. 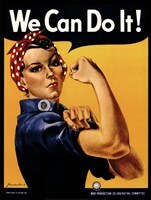 His portrayals of the work these women did made him to become very famous. Miller worked as a coordinating committee artist for Westinghouse War Production, and he was asked by the company to create a series of posters that would aid in the war effort. The artist worked with the company until the end of the Second World War before he faded from the public eye. 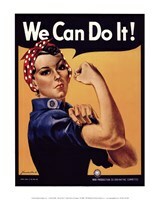 Miller was the creator of the famous poster "We Can Do It!" 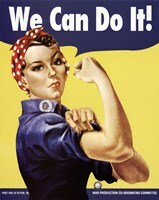 which he based on a picture of Geraldine Doyle working at a factory. The picture was taken by United Press International (UPI). The piece has since appeared on coffee mugs, shirts, and thousands of other collectibles. 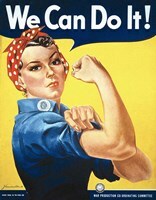 The poster came to be known as “Rosie”, though at the time of its release the name was not associated with the picture. Miller graduated in 1939 from the Art Institute of Pittsburgh. Many of Miller’s pieces of art were produced on large scale and used in towns and factories across the country.